Matt first starts be defining what we mean by “professional photographer”. This then allows us to determine what is a suitable camera. In my opinion, a professional is someone who’s making income from their photography, who delivers on their commitments, and makes their clients happy. You’ll note there was no mention there about years of experience, income level, type of training, or level of equipment being used. Not even a specific measure of skill. I’d say that’s a pretty fair summary, and it was true even in the film days. Probably more so in the later film days as cameras started getting smarter, compensating for photographer inadequacies. The reality is, as Matt suggests, that those with average equipment producing average work are still going to be successful if they’re good at business and communicating with people. And that’s not changed now in the digital era. The problem with defining “pro gear” is that any photographer who earns money from their work could be working in one of a thousand different fields. Sports & wildlife, landscape, portraits, events, they all have different demands and different needs. So, it’s impossible to create an all-encompassing definition of a “pro gear” spec. This is also why the “perfect camera” will never exist. Only the camera that’s perfect for your own needs. And you don’t always need the latest and greatest kit to get the job done. The take away I want you to get from this is, don’t feel pressured to use specific gear just because it’s considered “professional” or standard for your genre. If a $50 used camera gets the results you need, awesome! If you need certain features above that, more specialist gear, that’s also fine. Don’t fall into the ignorant trap of saying that “that gear isn’t suitable for pro work” or that “that photographer doesn’t know what they’re doing if they’re using that equipment”. In the past year, I’ve added four Nikon DSLRs to my collection. All used, none of them current generation. Why? Because they’re good enough to do the jobs I need them to do, and I got them for great prices on the used market. I picked up a D5300, a pair of D7000s, and a D800. Only one of those could ever really have been considered a “pro” body. But, they’ve all earned me money since acquiring them. So, does it really matter? The only real exception I’ve found is when you look at the manufacturers themselves. They have their own definitions of what they consider to be “pro” equipment. Nikon, for example has Nikon Pro Services (NPS). In order to qualify for membership in the UK, you need to own a minimum number of Nikon items. These items must be on a set list of “Pro” gear that Nikon specify. And that membership comes with some really great perks. If you don’t need the advantages of something like NPS membership, then you can shoot and earn money with anything you like. As long as your gear delivers the results that you and your clients expect, what’s the problem? 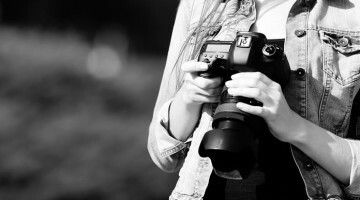 “The best camera is the one on you”. There’s this obsession about getting the latest and greatest gear, when some of the best pictures in the world were taken when full frame wasn’t even a thing. Just grab a decent camera, know your light, work out your technique and get to shooting. It’s a collosal scam. I knew a photographer who was using a d700. She went out and bought a d3 because she was turning pro. There are obvious technical advantages with every upgrade, but to make that the end-all be-all is just absurd. Unless you absolutely need a ridiculously fast shutter or super high ISO all the time, stick with what you have. That would be my best advice. This question, or versions of it, are running around the web. If you’re a pro, and the client is happy (and pays you) then whatever you used is “right”. In theory, pro gear is “better”. Does it matter? Not always. Well, it may to you, but the client? Probably not. There’s a fine line where the gear becomes props, maybe a marketing device. After a few decades of working with anything with a lens in the front and something to capture light in the back, what’s “pro level” it’s a bit of a blur. But to answer the question: No, you don’t. It’s the final image that matters. Hey I’m in that video!